Motichoor Ladoos are these delicious ball-shaped ladoos made from fine besan boondi and soaked in sugar syrup with a blend of nuts. They can be served for any occasion, a must try especially for Diwali. This recipe has several steps but once you’ve made and tasted them I promise you won’t regret all the effort you put into making them. Moti means bead or pearl in Hindi. 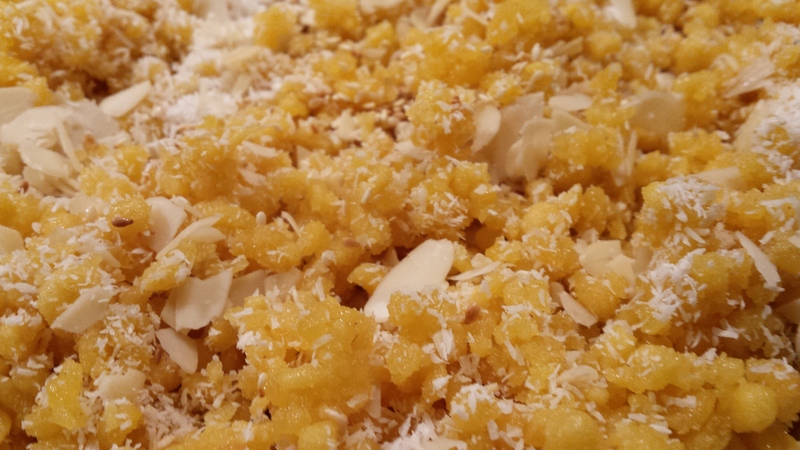 I feel very happy to share this recipe with you today on such a special day – more so as this was one of my dearest Papa’s favourite Mithai amongst many others, my very sweet loving and sweet tooth Paps. I know many reading this will smile as you know how true this is. In his words he would say “I am not eating I’m just tasting to see if it’s good…..”. Missing you everyday “Pa” with the sweetest memories by saying thank you for everything you did for us…..xxxxx And on this auspicious day may your blessing be with us always and you shine upon us just like the Diwali Diyas. ¾ cup finely chopped nuts and raisins – cashews, almonds, pistachios, desiccated coconut. Dissolve saffron threads and water in a pan and keep it aside. Start to prepare the sugar syrup, simply place water and sugar in a deep pan and leave to simmer. I like to add a couple of whole cardamom to the syrop for added flavour. While the syrop is cooking prepare the besan batter. Put the besan flour in a bowl make a smooth flowing batter of the gram flour/besan, crushed saffron and water. The batter should neither be thick nor thin, it should be a flowing batter. The consistency of the batter should be that it can be sieved through a sieve or a perforated ladle. Keep an eye on the sugar syrup, cook till one thread consistency is obtained and then stop the cooking. Remove front the heat and keep the syrop aside. Heat the ghee or oil for deep frying in a deep pan until moderately hot. Test the temperature by adding a drop of your besan batter; it should come up steadily on the surface. Take a perforated ladle/spoon position the ladle above the oil. 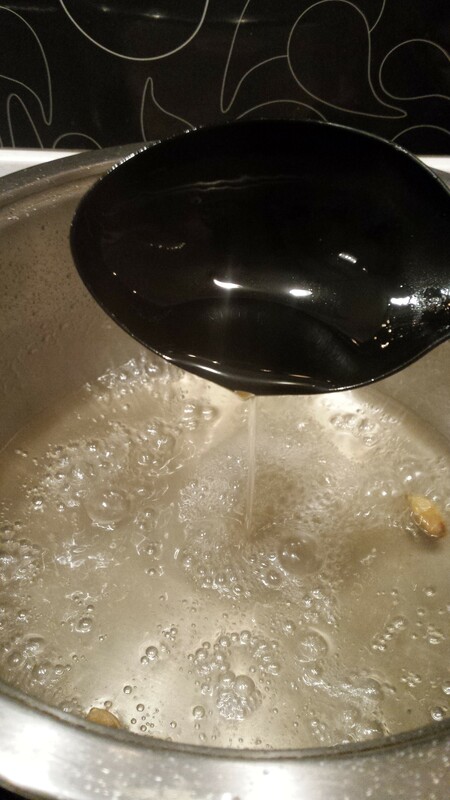 Put the besan batter through the ladle into the hot oil/ghee. This process is very quick but a very important part of making the boondis, have another large spoon ready to remove the fried boondis quickly. 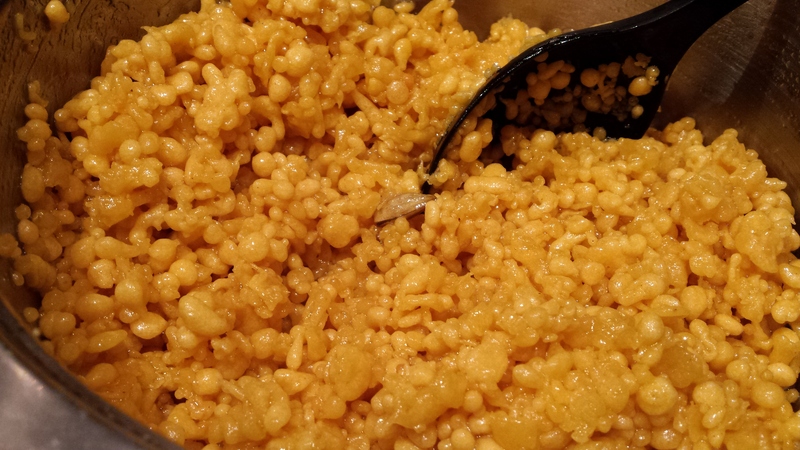 Fry the boondi till they become golden but not crispy. (To make this easier take a large spoon of the besan batter and pour it on perforated ladle/spoon, press with the other spoon so that the batter falls down from the perforations into the hot oil/ghee. 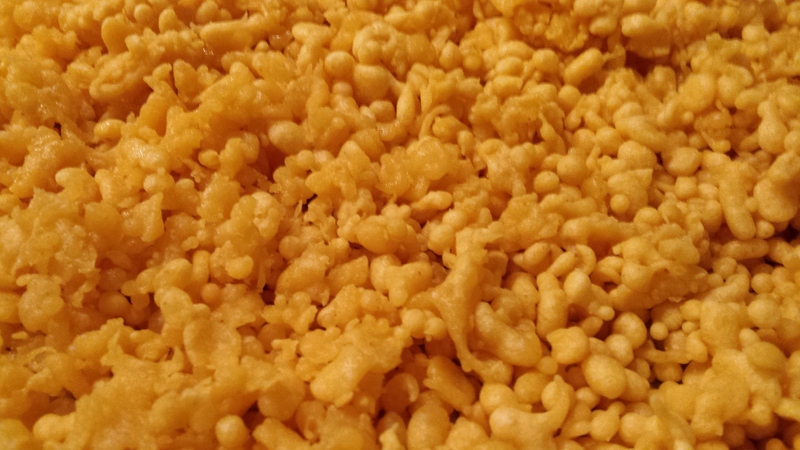 The reason I say it is important is because if the boondi becomes crisp then little balls won’t be soft enough be able to absorb the sugar syrup. Put the cooked boondis in a large tray on a paper towel to drain any excess oil. Once all the boondis are fried, start adding them to the sugar syrop. Please note, the sugar syrup should be hot when you add the boondis, so test it before adding the boondis. If needed you can keep the sugar syrop on a medium heat. Mix the boondis in the syrop until they have absorbed the sweet syrop and become soft. Now add the softened boodhis in a blender or mixer and pulse the boondi mixture for a few times to get a smaller shape. Don’t pulse too much otherwise you won’t be able to shape the motichoor ladoos easily. Remove from the blender add the chopped nuts, raisin, cardamom powder, desiccated coconut and mix well. Making the ladoos, apply some oil or ghee on your palms and shape the motichoor ladoos. To note, the mixture should be warm when preparing the ladoos. Garnish with chopped or slivered almond or toasted sesame seeds. Brinda’s Note: These Motichoor ladoos can also be refrigerated.